Where the Bucs game will be shown on free TV. Joe wasn’t aware there are so many Redskins fans in New Mexico. Basically five regions of the republic will get to watch the Bucs host the Redskins and hope Tampa Bay gets to break a three-game losing streak: Florida, Washington, D.C., Philadelphia, north Texas and… New Mexico! Unless Bucs fans live in those regions, they’ll need to head out to a bar or have NFL Sunday Ticket to watch the game. Thom Brennaman and Chris Spielman will be behind the mic for the FOX broadcast. 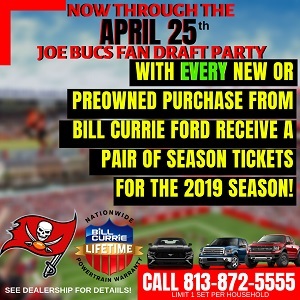 Of course, Joe always recommends taking in the Bucs game and the full slate of NFL action at Abe’s Place in Clearwater. The menu rocks. 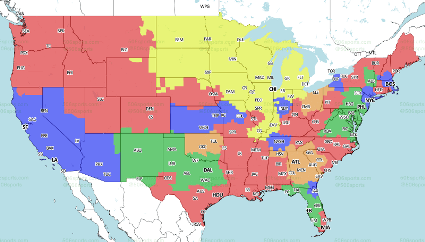 As always, this NFL TV map for Sunday’s FOX broadcasts is courtesy of 506sports.com. Green: Washington @ Tampa Bay. Red: New Orleans @ Cincinnati. Blue: LA Chargers @ Oakland (LATE). More than Bucs fans in Florida apparently. It either looks like MD is almost in or almost out of the TV range. Would love to watch the Bucs on TV rather than a stream for once. Joe Alburquerque flipped to the late game. Apparently the program director at their Fox affiliate felt that watching Chuckie lose 42-10 is better than watching 2 bad east coast teams flounder around…..
Those two are the absolute worst broadcast team for Bucs games. They don’t know the players, and they always seem to be for the other team. Glad I will be in RayJay so I can take it all in – and barf on the field if they let Washington have their way with our defense. Blogtalkfootball – I agree, these guys are basically unlistenable. 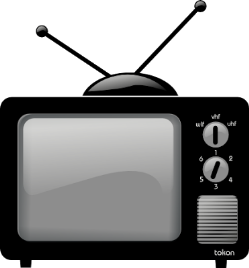 However, simple solution, just get an FM radio and listen to the radio broadcast. Bad part, they’re never in sync and there is no easy way to get things in sync.